The full-size Pilatus PC-6 Turbo Porter is a single-engined, seven-seater STOL aircraft (Short Take-off and Landing), designed as a highly versatile workhorse, and made by the Swiss manufacturer Pilatus Aircraft. It is widely employed as a bush aircraft, support machine, air ambulance, skydiver transport and crop-duster. The original aircraft is powered by a single turbo-prop engine. The ELAPOR® Pilatus PC-6 takes the form of a semi-scale model incorporating many detail features. For example, it includes all the simulated rivets and panel lines, aerials, a glazed cockpit, a scale sprung undercarriage and an attractive painted finish. The wings and tailplane are detachable. The model is very attractive on two counts: its intriguing appearance and its high fun factor – the machine offers plenty of the latter! Our Pilatus PC-6 has large control surfaces, ample power and beautifully balanced handling in the air, with the result that it is perfectly capable of vertical climbs, aerobatic maneuvers including knife-edge passes, and even torque rolls! With its large landing flaps the airplane can also manage extremely short take-off and landing runs – just like the full-size machine. A floats set is available for the Pilatus PC-6 as an optional extra. 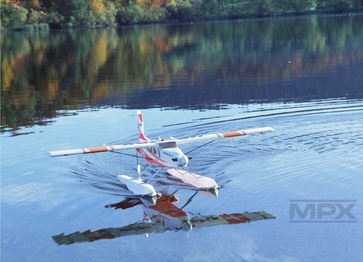 Fit the floats, and you can look forward to hours of fun flying from snow as well as water. 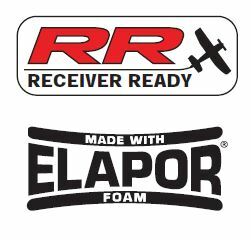 ELAPOR® model, 100% factory-assembled, including PERMAX BL-O 3530-1100 electric motor, MULTIcont BL-40 speed controller, 11 x 5.5” propeller, six MS-12016 servos, painted finish and decals applied, comprehensive instructions. Next Hobby Lobby is now Hobby Express!